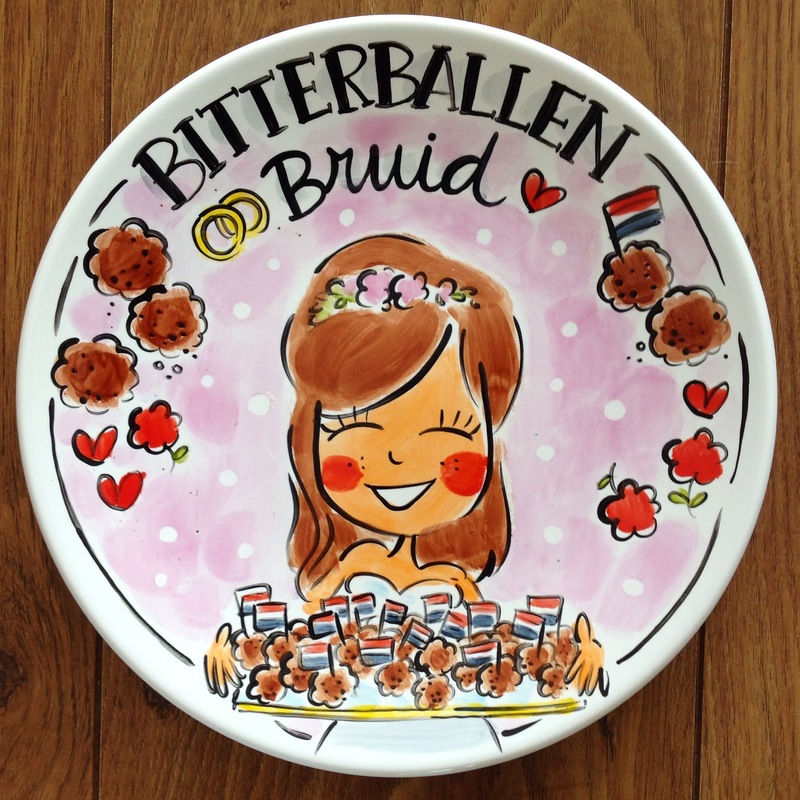 I love bitterballen so much… I married a Dutchman. Guys, is it even December if we don’t talk about food!? Or eggnog… a traditional Dutch alcoholic beverage made from eggs, sugar and brandy. The Dutch love it because it’s basically boozy custard. And who can blame them? When anyone thinks of New Year in the Netherlands they think of oliebollen – but apple fritters / beignets (or apple turnovers as we’d call them in English) are v.popular too! My Dad used to be a baker and I loooooved apple turnovers when I was a kid. 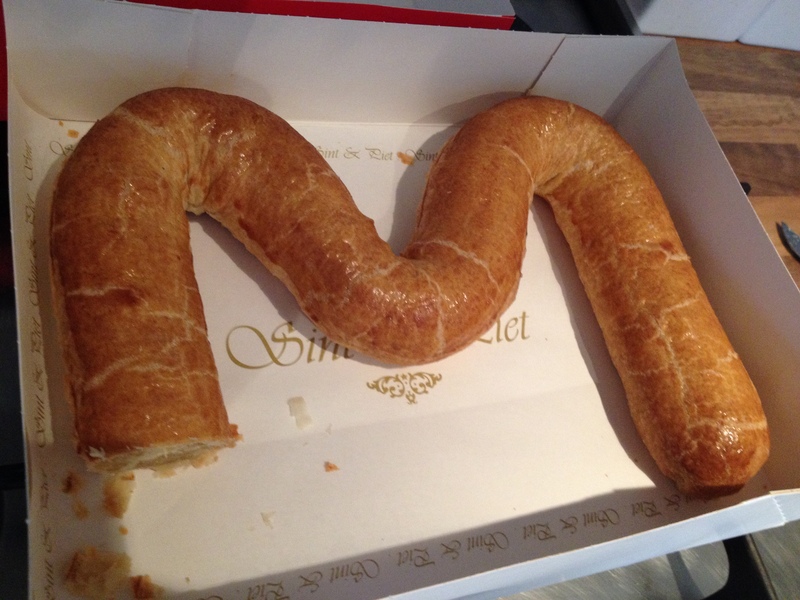 Pastry shaped into a log or a letter containing an almond flavour paste (known in the Netherlands as spijs or amandelspijs.) Absolutely delicious and about as traditional as you can get!! The Dutch version of glühwein (or mulled wine). Need I say more? My favourite of all the mashed Dutch food. Stamppot (meaning “mash pot”) consists of (lumpy) mashed potato with vegetables of your choice thrown in. My fave is with kale aka boerenkool. Stamppot is often served with rookworst (smoked sausage) and/or bacon lardons. Pea soup. Typically made from dried peas, such as the split pea. A bit like English pea soup… but better! Technically not a food or a drink, but a popular way of cooking / dining especially during the festive period! Read more about gourmetten. Oval-shaped Christmas bread with dried fruits and more amandelspijs. The Dutch version of the German ‘Weihnachtsstollen’. Marzipan, but in Dutch it’s pronounced something like mars-ze-pain (which makes me cackle every time)! 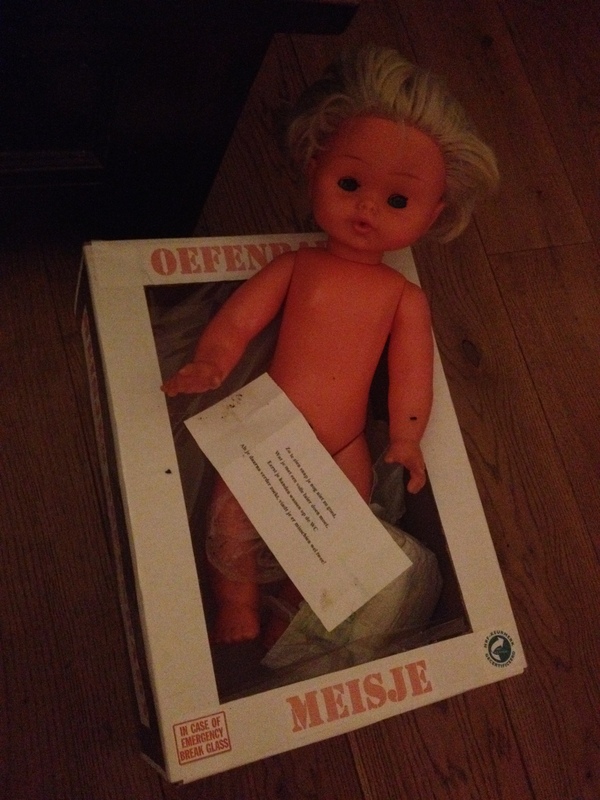 Ewwww… I am not a fan, but a whole lot of Dutch people would disagree with me! The dough is made from flour, eggs, yeast, salt, milk, baking powder and usually sultanas or raisins. They’re then sprinkled with icing sugar. 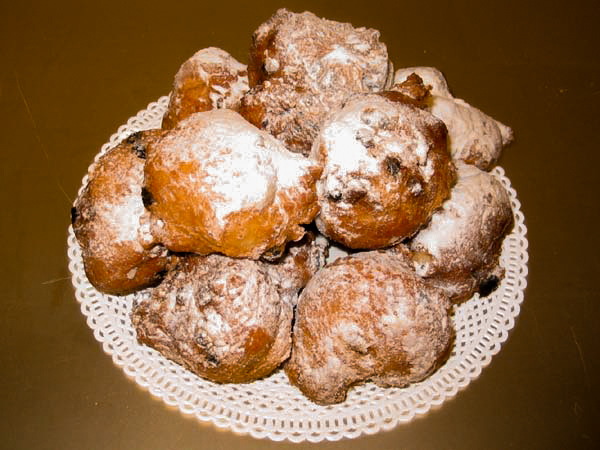 Oliebollen are traditionally eaten at New Year but there are oliebollen stands around for the whole festive period (so basically the whole of December). Spiced shortcrust biscuit, served around Sinterklaas time. Dutch people go wild for it. You can also get spreadable versions, with a peanut butter kind of consistency. Niet mijn ding (not my thing) but each to their own and all that. And the most important question: which is your favourite? 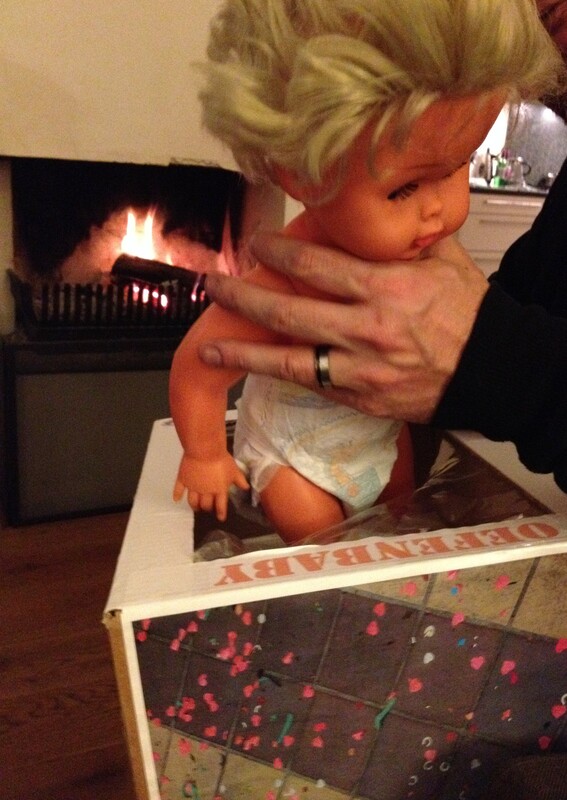 (My first Sinterklaas.) 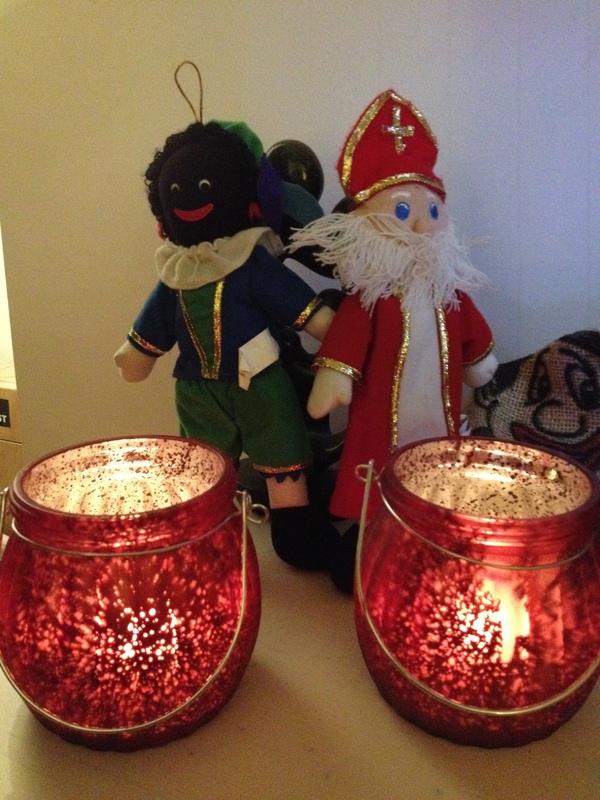 So, first things first: who or what is Sinterklaas? Sinterklaas is the Dutch version of the traditional figure, Saint Nicholas. Not to be confused with Santa or Father Christmas… he doesn’t come on 24th December or have reindeer or live in the North Pole. Sinterklaas arrives in the Netherlands on steamboat from Spain in mid-November with his helpers called ‘Zwarte Pieten’ (‘Black Petes’) and for the next couple of weeks there are Sinterklaas related events around the country (mostly involving Zwarte Piets throwing kruidnoten or pepernoten into the crowd – we’ll talk about those in a sec) before he heads back to Spain on his birthday, 6th December, for a well-deserved rest! 5th December is known as Pakjesavond in the Netherlands. (‘Pakjes’ means packages, but probably a better translation is ‘gifts evening’.) This is the culmination of several weeks of excitement – since his arrival in November – and the night when you eat loads of sweet treats and get presents! Yippee! Pepernoten literally ‘pepper nuts’ are small, round-shaped cookie like things made from flour, sugar, anise, cinnamon, and cloves. Not to be confused with kruidnoten literally meaning ‘spice nuts’ which are harder, have a different colour and shape and contain the same ingredients as speculoos. Traditionally, in the period between Sinterklaas’ arrival and pakjesavond, he rides around roof tops at night, delivering presents on his white horse named Amerigo. (Although most Dutchies call him Schimmel, which is the type of horse.) Young children leave out their shoe for Sinterklaas to put their present(s) in and often a carrot or some hay for his horse. This part gets a bit confusing for me as there doesn’t seem to be an actual date to do this… Sinterklaas can just rock up whenever he feels like it. So you have to have your shoe prepared! 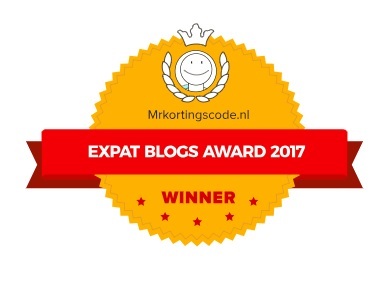 You might get a note saying where they’re hidden, or some people get a friend or neighbour to knock and run (pretending to be a Zwarte Piet) and leave a sack of presents for the kids to find. Despite the fact that I’ve been with a Dutch guy for 5 years, this year was my first Sinterklaas! Since my nephews are all 11+ there was no need to hire neighbours to deliver presents or leave notes… they already know the score, so there was just a pile of presents when we walked in. We were each given a member of the family to buy a gift for, organised via a Secret Santa like draw. In addition to a real present, we also had to make a ‘surprise’ for that person. The idea of a ‘surprise’ is to package the gift in such a way that it disguises the real gift in a humorous and personalised way. You also have to write a poem, and from what I saw that evening, the main goal is to take the piss out of that person… in a friendly way of course! 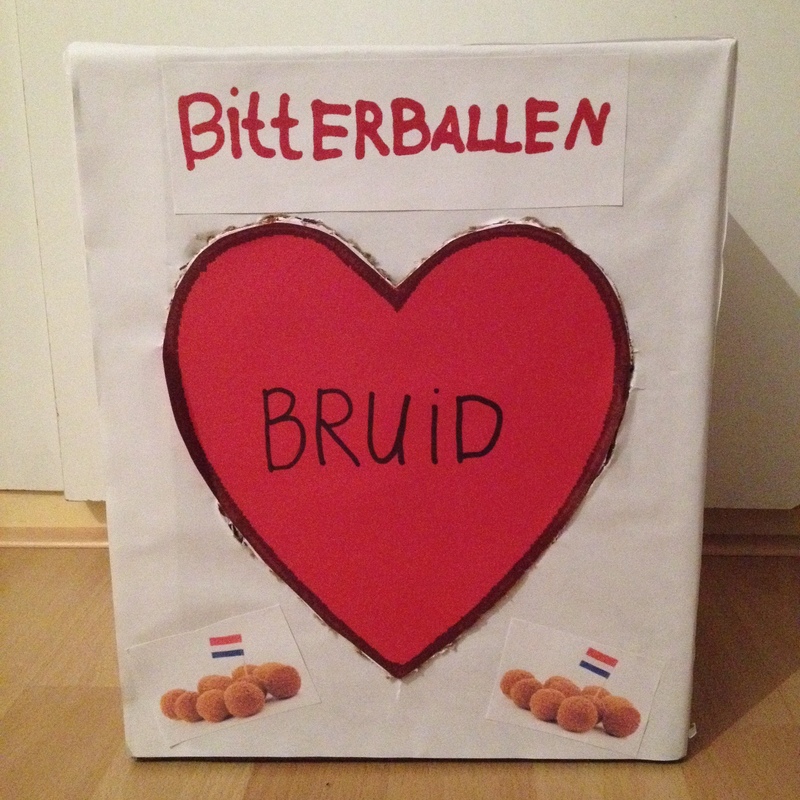 My gift was hidden in a special Bitterballen box, made by my youngest nephew, with my name on one side and a heart on the other with a secret door to get the presents out! Zo lief! (So sweet!) The ‘surprises’ are supposed to be exactly that by the way, but with only eight of us, it was pretty easy to guess who had got each person! I’ll spare you the poo pictures… It was damn funny though! Ps – you can now follow me on Facebook!